Trazodone Overdose Symptoms: Can You OD On Desyrel And Die? Trazodone overdose is a rare type of drug toxicity, which occurs mostly to people who receive a prescription for it. This antidepressant medication cannot produce the feelings of euphoria, so toxicity is usually consequent to accidental ingestion or an attempt to expedite relief from depressive symptoms by taking too much of the drug. This separates it from the majority of psychoactive drugs, where toxicities result from addiction or recreational use. Can One Overdose On Trazodone? What Is The Desyrel Overdose Amount? What Are The Risk Factors For Oleptro Toxicity? Can Trazodone Overdose Cause Death? What Are The Signs And Symptoms Of Molipaxin Overdose? What To Do If Someone Overdoses On Trazodone? How Is Desyrel OD Treated? Most people who use this drug have had to ask their doctors at some point whether they can overdose on Trazodone. It is possible to overdose on this antidepressant. However, this is not so common. 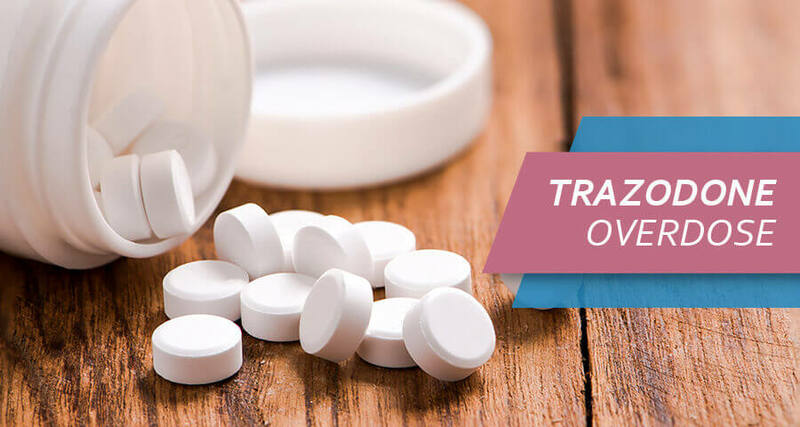 Trazodone is an antidepressant, which is prescribed for the treatment of depression and other conditions such as insomnia, pain from nerve damage, and panic disorders. This Desyrel drug class, with several different brand names including Oleptro, Molipaxin, and Trazorel has no recreative value, so an overdose rarely results from addiction or abuse. An overdose may also result from attempting to cause harm to oneself and commit suicide with Trazodone. So how much Trazodone does it take to overdose? Any amount beyond the recommended dose may cause toxicity. Generally, ingesting more than 600mg of Oleptro within 24 hours classifies as an overdose; the higher the amount ingested, the more severe the overdose symptoms that manifest. However, a lower dose may cause toxic effects if combined with other serotonergic drugs. The range of toxicities varies: ingesting up to 2-3g may cause respiratory failure and doses between 4-5g cause severe CNS depression and coma. Much lower doses produce toxic symptoms when combined with other drugs. Symptoms of Molipaxin toxicity usually occur within 24 hours or more of ingesting high doses. These factors increase one’s risk of overdosing on Trazodone. Age, body weight, and the rate of metabolism of Desyrel affect how long it stays in the system and how many Trazodone it takes to overdose. Trazodone drug interactions is a common risk factor for toxicity. Mixing Desyrel with other psychoactive substances may prolong its stay in the blood. Some of these include alcohol, opiates, and antihistamine drugs such as diphenhydramine. For instance, Trazodone and alcohol death results from the interaction between both drugs: alcohol prolongs Desyrel’s stay in the system, increasing the risk of overdose. Also, co-administration with drugs that inhibit the function of the CYP 3A4 enzymes – which metabolize Oleptro in the liver may cause it to accumulate, increasing the risk of toxicity. Examples of these CYP 3A4 inhibitors include ketoconazole, clarithromycin, and itraconazole. Liver and kidney impairment also increase one’s risk of Molipaxin toxicity. The liver degrades it, and the kidney excretes its metabolites. If the liver’s capacity to metabolize Desyrel or the kidney’s excretory function is impaired, the drug may accumulate in the system, increasing the risk of toxic Desyrel side effects even from a small dose. Can you overdose on Trazodone and die? Yes, one can die from an overdose of Trazodone. However, this is not so common. Furthermore, Trazodone overdose death is more likely when it is combined with other central nervous system depressants than when used alone. One of the significant causes of death from its toxicity is serotonin syndrome. Although rare, serotonin syndrome is a life-threatening condition associated with the use of two or more drugs that increase serotonin concentration in the brain. When serotonin becomes too much in the brain, it causes high fevers, muscle rigidity, abnormal heart rhythm, and seizures, which may lead to death. There are a few cases of deaths from ingesting Trazodone alone. In many of these cases, the individuals deliberately ingested large amounts to harm themselves. In one report, a 37-year-old woman ingested 6.45 g in a suicidal attempt. The patient developed seizures and severe cerebral edema, which led to her death. Apnea – intermittent cessation of breathing. If the individual is in a coma or experiencing life-threatening symptoms, call 911 immediately! Call the local poison control center or reach the toll-free national poison control hotline at (1-800-222-1222) for further instructions. Provide the call agents with these details: The person’s age and weight, the name of the medicine ingested (Trazodone generic name such as Desyrel), the time it was swallowed, and the amount that was ingested. Do not make the person induce vomiting, except the poison control or emergency hotline agent instructs so. Take the bottle or the container of the drug along, if available. As with most psychoactive drug toxicities, treatment for an overdose of Trazodone begins at the site of the incident. There is no Trazodone antidote. Therefore, time is the best bet in recovering from its toxic effects. Ensure emergency help is contacted as fast as possible. In the emergency room, Trazodone overdose treatment is mostly symptom-specific. Doctors may also administer activated charcoal, which binds to the drug in the stomach, limiting the amount absorbed in the gut. The doctors may pass a long tube through the mouth to the stomach to extract the ingested content, which includes the drug. This procedure is called gastric lavage. Doctors will also set up intravenous access for the patient, to administer intravenous fluids to normalize the blood pressure. If the patient has difficulty breathing, doctors may need to provide mechanical ventilation with oxygen administration to support the patient’s breathing and ensure oxygen supply to the tissues is optimal. Desyrel has no recreative value, and there are no Trazodone addictive effects. Therefore, it is not a drug of abuse. 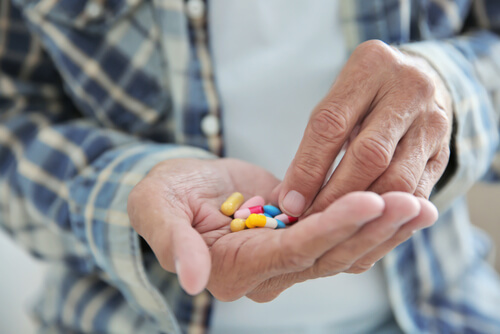 However, ingesting more significant amounts of the drug than prescribed or co-administering the medications with other depressants or drugs that impair its metabolism may cause toxic effects. To prevent an overdose, ensure to take doses prescribed by the doctor and to check with the doctor before using any other drug with it. Increasing the dosage without the doctor’s prescription may be a red flag of developing an addiction. Contact the rehabilitation facility and get the consultation whether it’s time to seek help. The sooner the drug abuse treatment was initiated, the more effective it is.